Whiteflash Review - Do they have the best quality diamonds? Blue Nile may have pioneered the initial boom in the way we buy diamonds online, but Whiteflash closely blazed its trail, bettering many of the once unique features offered by its competitors. With a near flawless reputation and a consistently returning client base, Whiteflash raised the bar of luxury online branding and customer service, and has continued to deliver seamless standard since the year of 2000. Whiteflash houses one of the biggest ‘in-stock’ inventories of any online diamond retailer. Its emphasis is on the Four Cs, and in particular, the cut of its diamonds. Working closely with a team of experts, Whiteflash adheres to the quality standards of internationally recognized diamond institutes such as AGS and GIA. 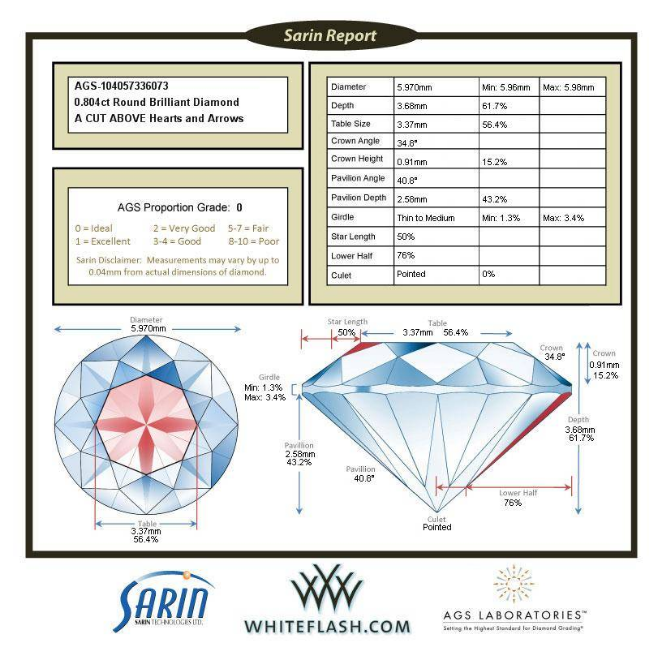 Whiteflash provides extensive technical data with regards to the cut of its diamonds and, in doing so, set itself apart with impressive standards. With its roots sown in Houston, Texas, Whiteflash has built a solid reputation through its drive for the highest standards. Its greatest achievement and contribution to the world of diamonds are found in its signature line A CUT ABOVE® Super Ideal stones. This cut of stone is masterful and technical, and is widely recognized as one of the most exceptional cuts of diamond, offering the greatest light return and Hearts and Arrows formation. Whiteflash’s success does not rest solely on this signature cut, but also through its continued pursuit of white gloves customer service and detailed technical advice that has found itself to be a top choice for buyers. At the time of writing this review, both James Allen and Blue Nile only carries five designers each. In this instance, it’s not only just the quantity game but the quality too. Simply put, Whiteflash is the only one out of the three online jewelers that carries the top four designers in the world – Tacori, SimonG, Ritani and A.Jaffe. The designers on James Allen and Blue Nile rosters are great too, but they are just smaller and less-known designers. This means that Whiteflash is simply one the largest jewelers offering an array of settings, styles, and choices online. Whether you’re looking for a typical American style with heavy use of beading, embellishment and side stones, European elaborate vintage look, or modern petite look, Whiteflash got you covered. Nevertheless, Whiteflash boasts one of the largest inventories of AGS Ideal and Super Ideal Cut round brilliant and princess cut stones, which should be all about when it comes to buying diamonds. The advantage of in-house stock is the assurance that Whiteflash’s experts have assessed the diamonds before they are sent. This step can often be missed with other online traders, who may opt to ship straight from vendor to client, without a thorough examination of the stone in question. Quality and choice should always be championed when buying a diamond online; however, website comprehension is also key in the buying experience. This is where Whiteflash falls behind some of its competitors. While the same basic principles of filter and search options are applied, the website does not have the same cohesive feel of the James Allen website. If my memory serves me correctly, Whiteflash updated its website to a responsive one not too long ago following their customers’ feedbacks and reviews, and I can see constant improvements since then. Whiteflash may be fall short on the filter and search options, but I believe it will quickly catching up with James Allen and Blue Nile, and potentially surpassing these two sites one day. One key thing you have to remember is that Whiteflash is a premium brand and its target audience differs from Blue Nile and James Allen, and its website design reflects so. When you have chosen the stone, the importance of cut to the Whiteflash experts is immediately evident, with detailed images of the diamond beneath UV lights and under a microscope. While this undoubtedly offers an impression of the fire and brilliance you can expect within the diamond. It is yet another example of Whiteflash’s explicit attention to quality and detail. The light performance images demonstrate the superior quality of its diamonds. Whiteflash also provides the 360° videos of your chosen diamonds and all the technical data, such as extensive document and certifications that will come with the diamond. These detailed reports allow for an accurate side-by-side comparison with its competitors. Whether you’re a beginner or diamond geek or anyone in between, Whiteflash’s Diamond Education Center has every article targeting at everyone. All of its articles are written by gemologists who have over 30 years of experience and teachers. If you must, bookmark the page and study there soon you will, too, come an expert. 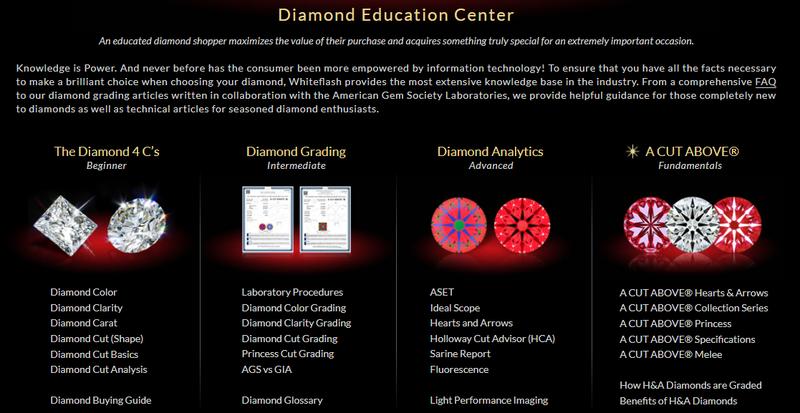 It’s true that all diamond or jewelry merchants have an Education section, but if you compare the level of expertise with Whiteflash’s, you’ll definitely see the difference. When looking at Whiteflash, it is important to think of the company in a more ‘traditional’ sense in terms of its online retail position. The advantage of this is the guarantee that its diamonds have been approved by its experts, and will undoubtedly be of an excellent standard. Wrapping your head around the many terminologies, stamps, watermarks and technical imagery can make the process feel a little overwhelming. The diamond world can be dazzling complicated as it is, and it is the job of the online experts like Whiteflash and myself to present the experience with as much clarity and ease as possible. This is more than compensated for with its exceptional customer service which is provided by both telephone and live chat options. Education is key in the world of diamonds, and it is evident from Whiteflash’s offerings that its desire is to empower the buyers with facts in order to prove its premium diamond selections. Whiteflash is known for its A CUT ABOVE® Super Ideal Cut diamonds. These stones are considered to be of world-class and super ideal cut, and Whiteflash uses stringent procedures to ensure only the finest diamonds make the grade. The stones are renowned for their perfect Hearts and Arrows formation, allowing for the greatest light return. This is where Whiteflash truly set itself apart; its passion and belief in this cut is presented in great detail across its website. The lab reports, technical data, and images it provides for each stone are the same as those used by its expert gemologists. The transparency of this shows Whiteflash’s confidence and honesty within the world of diamond retail. To simplify, this is where A CUT ABOVE® diamond would be placed, relative to AGS and GIA premium cuts. The small bracket demonstrates the standard that Whiteflash strives for in its offerings. Whiteflash’s approach is entirely unforgiving, and only the most precise and masterful cuts are allowed the title of A CUT ABOVE®. While an excellent attribute to have with any diamond, its heavy push on in-house stones leaves little room for exploring other elements of the stone. The technical data is void without an in-depth understanding of its relevance. Education when buying a diamond is essential, but buying from Whiteflash may involve more study time than one is willing to give. It is clear from its selection of services that Whiteflash prides itself on customer satisfaction as well as return businesses. It offers international shipping, complimentary ring sizing and money back guarantee among a host of other buyback and upgrade options. Whiteflash is creating a foothold in return business by keeping its buyers close. Through my research on diamond upgrades or trade-up schemes, Whiteflash seems to have the best upgrade policy compared to other major jewelers, including Tiffany’s, with its simple and straightforward approach. With Whiteflash you need not buy a more expensive diamond - may that be increase in carat, clarity or size, while other jewelers will require you to purchase at least 50% more expensive diamonds - to qualify the upgrade scheme. If you are an old hand at buying jewelry, Whiteflash will certainly appeal to you. Real thought has been put into presenting the cold, hard scientific facts to the buyers. In the same breath, if you have absolutely no experience in buying jewelry, you will still be impressed by Whiteflash’s offers, guarantees and endless badges and certifications that feature across its website. It is worth taking the time to familiarize yourself with Whiteflash’s A CUT ABOVE® line, as well as its other exceptional in-house cuts. The diamonds really are some of the best that can be found in online retail. If you manage to cut through the technical jargon (or indeed, learn its value), and choose to buy from Whiteflash, the diamond itself will dazzle with a sparkle like no other. Whiteflash has undoubtedly set a new standard in its honesty, integrity, and quality within the world of diamonds. Do also read my reviews on James Allen and Blue Nile.